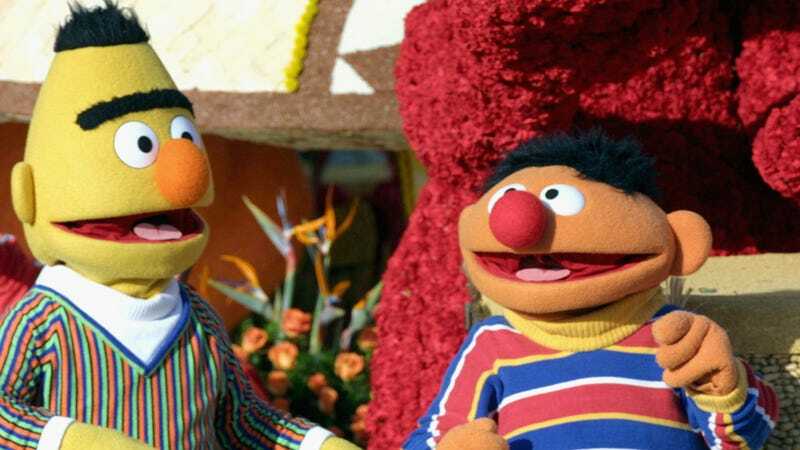 In an interview with Queerty (via The New York Post), longtime Sesame Street writer Mark Saltzman has revealed that he always envisioned Bert and Ernie as a “loving couple” in a relationship, not just a pair of dedicated roommates/best friends. Saltzman, who is gay, says it wasn’t a “huge agenda” he was trying to push when he wrote for the characters, he just “didn’t have any other way to contextualize” Bert and Ernie than to drawn inspiration from his own relationship with film editor Arnold Glassman. He said Glassman—like Bert—was always very straight-laced and organized, while he—like Ernie—is more of a “jokester.” So, without directly acknowledging it in any way or really admitting to anyone that he was doing it, Saltzman based the characters on his own life and wrote Bert and Ernie as a gay couple living together. In fact, he says more than one person used to refer to him and Glassman as Bert and Ernie since their dynamic was clearly represented on the show. Meanwhile, Sesame Street’s official stance is that Bert and Ernie aren’t gay because they’re just puppets, so therefore they “do not have a sexual orientation”—according to a 2011 statement. That being said, the implication has pretty much always been there, even for those of us who don’t know Mark Saltzman personally, which is why the question of whether or not Bert and Ernie are meant to be in relationship seems to pop up every few years. This time around, Sesame Street has released an identical version of that 2011 statement, reiterating that the two puppets don’t have a sexual orientation, but the all-important Sesame Street canon seems like it should be irrelevant in this case (not to mention the fact that there are loads of straight puppets in the Muppet universe). They were written to mirror a real-life gay couple in a loving relationship, at least when Saltzman was doing it, so even if Sesame Street won’t say that they’re dating, the fact that there’s positive representation of relationship like that on a show for kids is all that really matters.